What inspires us to create? 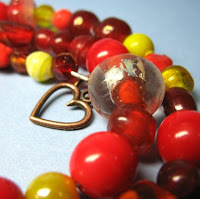 When I make jewelry I am usually inspired by the actual materials that are available to me. I am also inspired but the shapes that can be made by weaving beads. Inspiration is everywhere if we know where and how to look. As many of you know, I am a singer. In singing, music is a constant source of inspiration to me. I love singing different styles of music and learning about its corresponding culture. 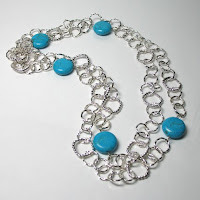 I have to admit though, in jewelry making I have not used music as an inspiration. Except maybe if I need a piece to wear for a concert or recital and I make a piece that goes with the theme and what I am wearing. Other than that though, nada. This one is called "chain chain chain." I LOVE it. 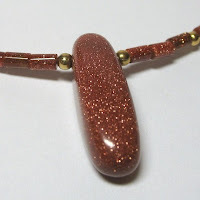 Finally, "All that glitters is Goldstone"
This is such a creative way to design! Kudos to Seajewels2005. You can check her out at www.seajewels2005.etsy.com . Also read her blog at http://thecraftersguildplace.blogspot.com/ . What about you? What inspires you to create? What is it that you create? Maybe I will feature you! Leave some comment love on it. Thanks!